Clothing and accessories to support the cause. While Central Park will serve as the hot spot for the annual Global Citizen Festival on Sept. 26, all attention shifted on Sunday evening to Pier 59 Studios. That’s where Nolcha Shows, producer of runways for indie designers, previewed this year’s Global Citizen Festival 2015 fashion line, a highlight of their “Ones to Watch” event during New York Fashion Week. The Global Citizen movement’s goal is to end extreme poverty worldwide within the next 15 years, and it has partnered with organizations such as The Hunger Project, The Earth Institute and UNICEF. Its platform serves to inform the public and encourage people to take supportive actions, like contacting one’s senator, signing petitions or getting involved via social media. Such activities also allow prospective festival attendees to earn points towards admission. 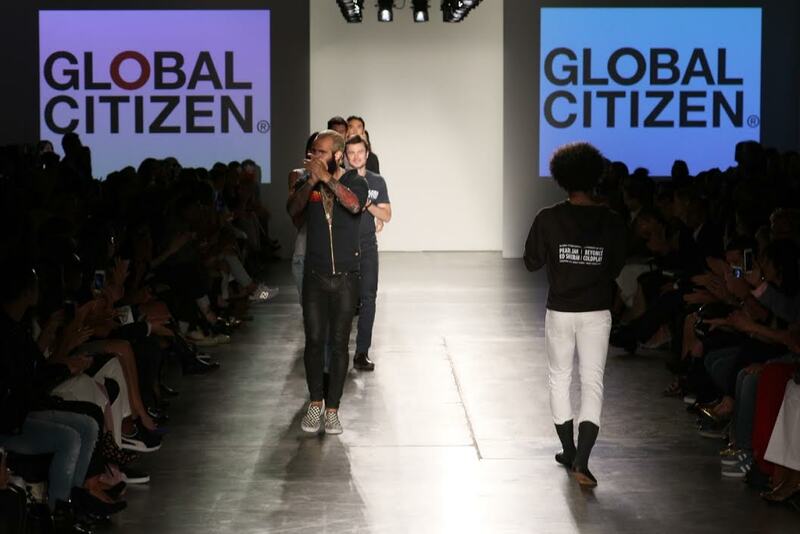 Four campaign managers from the non-profit Global Poverty Project (GPP) modeled an array of casual merchandise on Sunday, all reflecting Global Citizen’s cool style. They sported tank tops, hoodies, sweatshirts, hats and a limited edition collection of Aviator Nation sunglasses. With the purchase of these conscious goods, available on Sept. 26 online and at the festival, consumers and concertgoers can also display their support since proceeds benefit GPP. The blockbuster concert is the main event later this month, and another worldwide rock star that has also inspired promotional merchandise will only be a short train ride away. Though Pope Francis will be concluding his New York City visit and heading to Philadelphia just before Sept. 26, he’ll still be at Central Park in spirit to support the worthwhile cause.